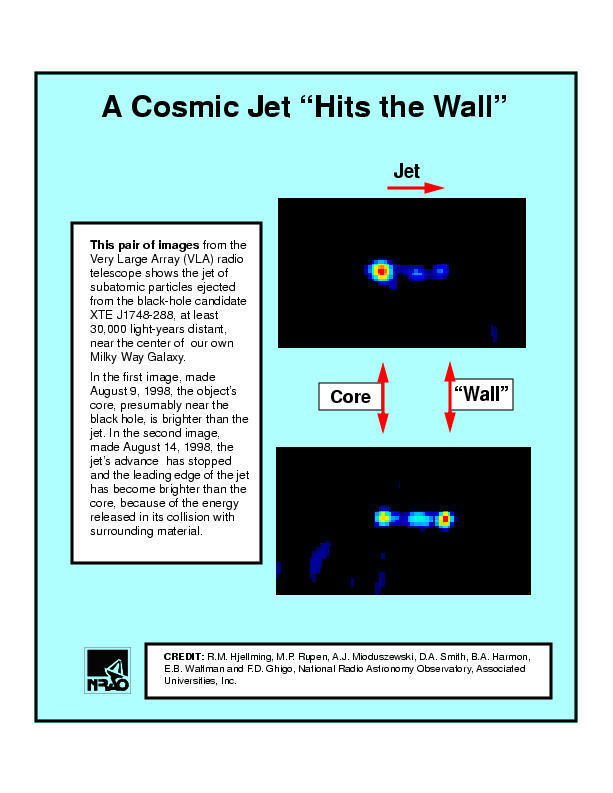 Cosmic Jet "Hits the Wall"
NRAO Home > Press Releases > Cosmic Jet "Hits the Wall"
Superfast Cosmic Jet "Hits the Wall"
A superfast jet of subatomic particles presumably powered by the gravitational energy of a black hole has collided with nearby material, been slowed dramatically and released much of its energy in the collision, radio astronomers report. The astronomers used the National Science Foundation's Very Large Array (VLA) radio telescope to observe the jet's motion. This is the first time such a collision has been seen within our own Milky Way Galaxy, and the collision may shed new light on the physics of cosmic jets. Robert Hjellming, Michael Rupen and Frank Ghigo of the National Radio Astronomy Observatory (NRAO); Amy Mioduszewski of the Joint Institute for VLBI in Europe; Don Smith of MIT's Space Research Lab; Alan Harmon of Marshall Space Flight Center, and Elizabeth Waltman of the Naval Research Laboratory reported their findings today at the American Astronomical Society's meeting in Austin, TX. The cosmic jet comes from an object called XTE J1748-288, at least 30,000 light-years away in the constellation Sagittarius, near the center of the Milky Way. XTE J1748-288, discovered on June 4, 1998, by Don Smith, using the RXTE satellite, is a "black hole candidate," probably consisting of a black hole drawing material from a companion star and accelerating jets of material outward in the process. A series of VLA images showed a "blob" of material in the jet moving at an apparent speed at least 50 percent greater than that of light. This is only the third such "superluminal" jet seen in our own Galaxy. The apparent faster-than-light motion is an illusion created by geometric effects when jets move at nearly the speed of light and are aligned so that their motion is somewhat toward Earth. The two other Milky Way objects whose jets show such rapid motion are dubbed "microquasars," because their behavior mimics that of quasars -- much larger objects seen at the cores of very distant galaxies. A series of VLA images showed material ejected as a jet from the core of XTE J1748-288. The jet travelled quickly until its advance suddenly was stopped and the endpoint of the jet became brighter than the core. "This fast-moving material obviously hit something," Hjellming said. What did it it hit? "Probably a mixture of external material plus material from a previous jet ejection." Further studies of the collision could yield new information about the physics of cosmic jets. Such jets are believed to be powered by black holes into which material is being drawn. The exact mechanism by which the black hole's gravitational energy accelerates particles to nearly the speed of light is not well understood. There is even dispute about the types of particles ejected. Competing models call for either a mixture of electrons and protons or a mixture of electrons and positrons. Because protons are more than 1,800 times more massive than electrons or positrons (the positively-charged antiparticle of the electron), the electron-proton mixture would be much more massive than the electron-positron pair. Thus, an electron-proton jet is called a heavy jet and an electron-positron jet is called a light jet. A light jet would be much more easily slowed or stopped by tenuous interstellar material than a heavy jet, so the collision of XTE J1748-288's jet may indicate that it is a light jet. "There's still a lot more work to do before anyone can conclude that, but the collision offers the possibility of answering the light-heavy jet question," Hjellming said. A 1998 VLA study by John Wardle of Brandeis University and his colleagues indicated that the jet of a distant quasar is a light, electron-positron jet. Though the black holes in quasars are supermassive, usually millions of times more massive than the Sun, the physics of jet production in them is thought to be similar to the physics of jet production by smaller black holes, only a few times more massive than the sun, such as the one possibly in XTE J1748-288.